Frederick, B.C., Gulick, S.P.S., Fernandez-Vasquez, R.A., Blankenship, D.D., Young, D.A., Domack, E., Leventer, A, Blum, M., 2018, Quantitative Geomorphological Analysis of the Sabrina Coast Continental Shelf and Aurora Subglacial Sedimentary Basins, East Antarctica, Geomorphology (In Preparation). Frederick, B.C., Blum, M.D., Snedden, J.W., Norton, I.O., 2018, Continental-scale provenance, paleodrainage, and structure of the Pre-Salt Eagle Mills Formation and coeval formations, Northern Gulf of Mexico Basin, GSA Bulletin (In Preparation). Frederick, B.C., Blum, M.D., Fillon, R.H., Roberts, H.H., 2018, Resolving the contributing factors to Mississippi Delta subsidence: Past and Present, Basin Research, p. 1-20, doi: 10.1111/bre.12314. Blum, M.D., Pecha, M.E., Milliken, K.T., Snedden, J.W., Frederick, B., Galloway, W.E., 2017, Detrital-zircon record of Cretaceous through Oligocene drainage integration and sediment routing for the northern Gulf of Mexico margin, Geosphere, 13 (6), p. 1-37. Frederick, B.C., Blum, Mike D., Lowery, Chris M., Snedden, John W., 2016, Resolving Pre-Salt Sediment Source Terrains and Dispersal Pathways for the Northern Gulf of Mexico Basin, 35th Annual Gulf Coast Section SEPM Perkins-Rosen Research Conference, p. 233-251. 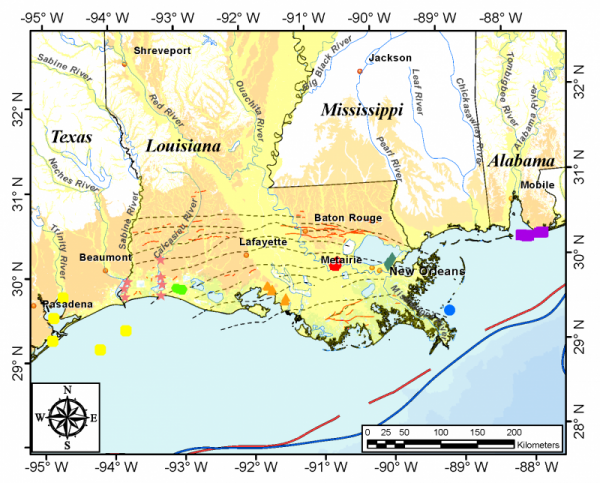 Blum, M.D., Milliken, K.T., Snedden, J.W., Frederick, B., 2016, Cenomanian Gulf of Mexico Paleodrainage from Detrital Zircons: Source-to-Sink Sediment Dispersal and Prediction of Basin Floor Fans. In: Mesozoic of the Gulf Rim and Beyond: New Progress in Science and Exploration of the Gulf of Mexico Basin. 35th Annual GCSSEPM Perkins-Rosen Research Conference, p. 344-366. Frederick, B.C., Young, D.A., Blankenship, D.D, Richter, T.G., Kempf, S.D., Ferraccioli, F., Siegert, M.J., 2016, Distribution of subglacial sediments across the Wilkes Subglacial Basin, East Antarctica, Journal of Geophysical Research, 121, p. 790-813. Goff, J.A., Allison, M.A., Gulick, S.P.S., Reece, R., Davis, M., Duncan, D., Saustrup, S., Aisner, R., Alvarez, G., Rocio Bernal, A.B., Campos, H., Chang, L., Eakin, D., Fongern, R., Hereid, K., Huffman, R., Lester, R., Ramirez, M., Bales, K., Dunlap, D., Erturk, N., Frederick, B., Greenbaum, J., Lunsford, J., Meyer, D., Neely, W., Sanford, J., Tudor, E., Vara, M., Zurbuchen, J., 2014, Shoreface ravinement evolution tracked by repeat geophysical surveys following Hurricane Ike, Bolivar Peninsula, Texas, 2008-2013, Geophysics, Vol. 80, No. 3, p. WB1 – WB10. Pinet, P.R., McClennen, C.E., Frederick, B.C., 1992, Sedimentation erosion patterns along the southeastern shoreline of Lake Ontario, in April, R.H. ed New York State Geological Association Field Trip Guidebook: Hamilton, NY, Colgate University Dept. of Geology, p. 155-169. Frederick, B.C., Domack, E.W., McClennen, C.E., 1991, Magnetic susceptibility measurements in Antarctic glacial-marine sediment from in front of the Muller Ice Shelf, Lallemand Fjord, Antarctic Journal of the United States, 26 (5).